Employers love passive candidates. In fact, as many as 58 percent of employers focus on passive candidates when filling open positions. These currently employed candidates can be a great addition to your company and will likely be able to hit the ground running once hired. The problem with passive candidates is how hard they are to pin down. Video interviews are helping employers finally connect with passive candidates with a lot less hassle. Passive candidates are good for companies because they are already thriving in a similar position, which shows you the candidate can bring concrete value to your company. However, the fact of this candidate’s employment can also make it extremely difficult to reach them for recruiting. A packed schedule can get in the way of even an interested passive candidate. Does this mean you should give up on passive candidates? No way! Letting go of this talented candidate pool would be a huge mistake. It would also go against the numbers. According to a new survey, an impressive 74 percent of workers would consider leaving their current jobs if a better offer came along. These weren’t all unhappy employees either- job satisfaction had little influence on their answers. If you ignore passive candidates because connecting can be inconvenient, you’re ignoring a huge subsection of talent ready to jump at a new opportunity. One of the biggest roadblocks to connecting with top passive talent is the difficulty of scheduling a meeting. Unlike unemployed job seekers or active candidates, passive candidates might be reticent to drop everything for an interview opportunity. It’s likely these candidates have schedules just as packed as your own, and finding common ground between multiple crowded calendars can be a challenge. Video interviews cut down on this problem by allowing candidates to easily fit an interview in around their schedules. Instead of taking time off from their current job to meet with you, a candidate can connect with your company on their own time using the power of video interviewing. 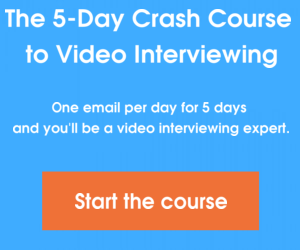 An especially convenient interview method for passive candidates is the one way video interview. In one way video interviews, employers pose written questions to which candidates answer in video format. It’s asynchronous, which means both candidates and employers can fit these interviews into the rare gaps in their schedules. Passive candidates can even use their mobile device to record interview answers, making it easy for on-the-go candidates to still interview with your company. This format is great for busy passive candidates who might be hesitant to express their interest in your company. This way, if candidates decide against pursuing your job opening you haven’t lost time and energy on half hour phone interviews or meticulously scheduled in-person meetings. Video interviews can cut out the commute for the passive talent interested in your company. Instead of flying in a great candidate or waiting while they’re stuck in traffic, live video interviews allow you and your passive candidate to speak face-to-face without all the hassle. This could be a real plus for a busy worker who has trouble adding time on to their already long commute to stop by your office. Now interviews can be performed from the boardroom or the den. Unlike phone interviews, video interviews allow employers and passive candidates to connect personally faster than in the traditional hiring process. Passive candidates may be unsure they really want to commit to a full scale job interview with your company, but will be more likely to say yes to a time-saving video interview. Yet even without seeing the candidate sitting across the desk, it’s still possible to cultivate a personal connection and evaluate a candidate’s nonverbal behavior. Passive candidates are a great source of talent for any company to explore. Online video interviews are allowing employers to more easily reach out to these candidates and spark a connection. You never know, your next superstar employee might be the passive candidate on the other side of the webcam. How have you used video interviewing to hire great passive candidates? Share in the comments section below!